In the continued adventures of the Friday Fan Art Round-Up we showcase art pieces paying tribute to Game of Thrones and Child of Light among others. Another Friday is here and with it The Escapist is back to deliver unto our dear readers another handsome batch of random art from the furthest reaches of the interwebs! This week's Friday Fan Art Round Up includes art pieces paying tribute to Game of Thrones, Child of Light, Conan the Barbarian and everyone's favorite kill-or-be-killed zombie game: DayZ. 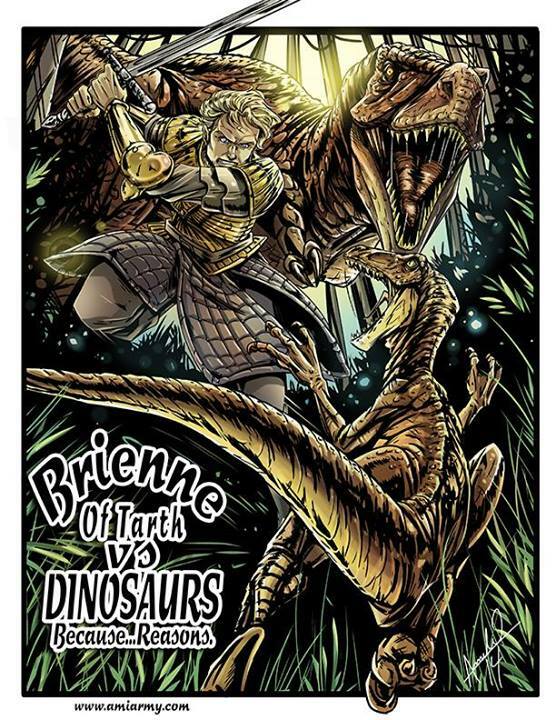 "Sometimes you just need to take a few hours out of your life to draw Brienne of Tarth fighting dinosaurs." If ever there was a sentiment I could agree with, that's it right there. After all, even with Tyrion Lannister hoarding pretty much all the awesome points recently, you'd be hard pressed to find many Game of Thrones fans who would deny the bad-assery of Westeros's premiere warrior-maiden. 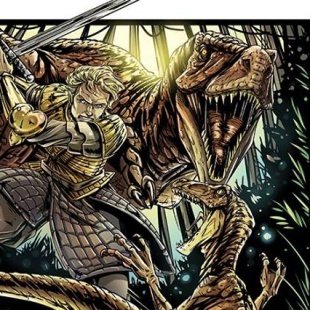 Granted, we're not sure if she could really take down an angry velicoraptor, but we won't begrudge artist Amelie Belcher for wanting to believe she could. 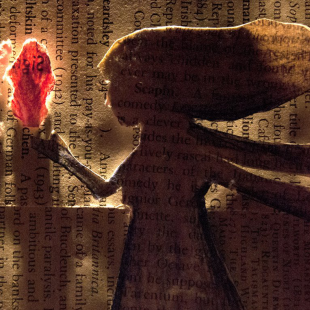 Even if Child of Light was, in some ways, less than perfect, one thing it got down perfectly was its fairytale whimsy and its hand drawn visual style. 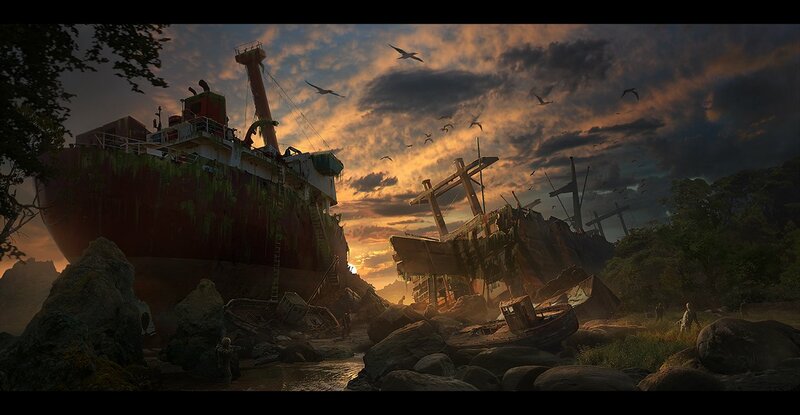 Sincerely, I just wrapped up my playthrough and you can seriously get lost just looking at stuff. Plain and simple, it's a gorgeous piece of game and we have no doubt that fans will be modifying, recreating and paying tribute to it for years to come. Take artist Alonwyn Claius, for instance. 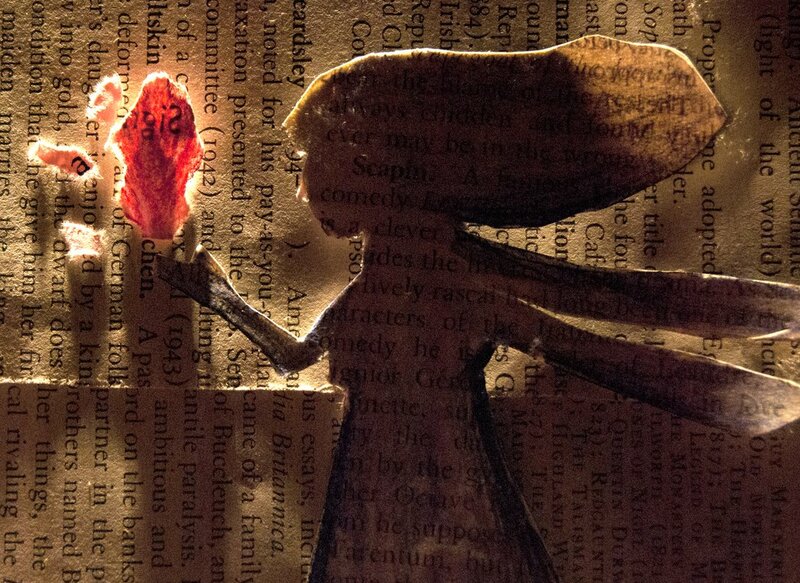 A fan of the game he put together a small art piece using the pages of a book to recreate princess Aurora. Setting aside how well it fits thematically, it also just happens to look really great. I love me some Conan the Barbarian. In fact, when I take a look at my list of favorite fictional characters, Robert E. Howard's Cimmerian warrior rests pretty well near the top (below Darth Vader but just above Goliath from Gargoyles). That in mind, it took me all of two seconds to fall in love with Andrea Cofrancesco's The Destroyer. Combing the visual style of Frank Frazetta's groundbreaking Conan art with a more cartoony sensibility, Confrancesco captures the cocky potency of the world-famous barbaria pretty much perfectly. He also scores bonus points for his inclusion of the Atlantian sword from the Arnold Schwarzenegger film. DayZ is one of those games that I intensely want to try but am pretty sure I never well. Between a lousy PC and a general lack of abundant free time, the odds are just very much against me taking up a life of post-apocalypse banditry. That aside, I still really enjoy reading about other people's experiences with the game and can also appreciate the work of those trying to show their appreciation for the unique experience it offers. 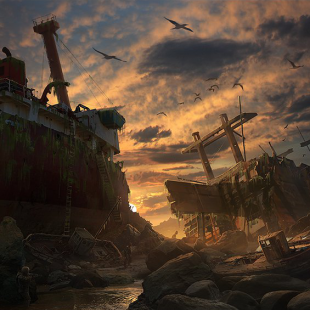 Take Simon Weaner's recent photo/painting hybrid which transforms a beach from Quebec City into a rotting shipwreck overrun by the dead. What do you think of these art pieces? Were there any special bits of fan art you encountered this week? Let us know and feel free to share in the comments section!